The Kingdom of Hungary (15.03.1848-19.04.1849) was part of the Habsburg Empire. In 19.04.1849 the Parliament of Hungary declarate the detronisation of the Habsburgs and the independence of the state. (19.04.1849-september/october 1849). The flag of the Kingdom of Hungary was the red-white-green flag without insription. Some time ago I described a Hungarian war flag used in 1848 revolts, as it is shown on the Hungarian post stamps of 1948. The flags on the stamps are in shades of one colour, so I have coloured it as it seemed right to me. I believe that it is quite right. The flag is white, bordered with red and green triangles. In the middle there is a shield of Hungarian arms, without the crown, surrounded with a wreath of oak(?) leaves. As much as I know, the Hungarian tricolour was used for the first time used in 1848, so this is not the national flag. I guess it must be the flag of the army. 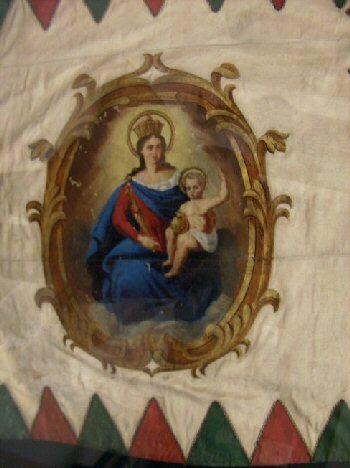 I back up this assumption by noting that a similar flag is used today by the Hungarian army, with the only difference in the shape of the shield and the crown of St. Stephen over it. That flag I have seen used by Hungarian units stationed in Croatia in UN forces, but I don't know if this is a war flag or the flag of the respective unit. 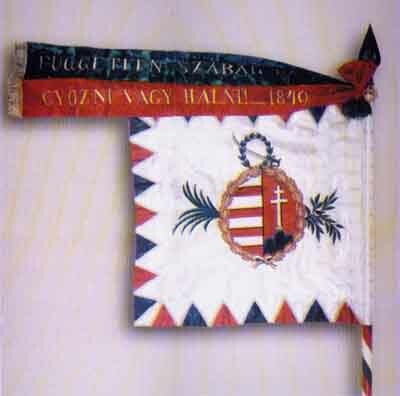 Some examples of 1848-9 war flags can be seen at <www.oszk.hu/kiallit/1848/zaszlo1.html> and <zaszlo2.html>. I was in Hungary in March 1998 during the celebration of 150 years to the revolt. It was quite impressing. I saw many variants of the 1848 revolt flag. It seems to me that those flags are all hand-made and not mass produce, and therefore there are many variants. Todays replicas has the same both sides, but I can not rule out that in the original flags there were different sides. 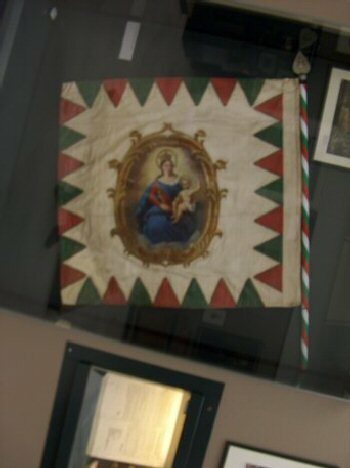 Two more (Really just close ups on the Coat of Arms) of Hungarian 1849 flags at: <www.interj.datanet.hu>. "Finally I would like to raise awareness to a newer interesting vexillological finding. In the rich flag archives of the Ja'sz museum I accidentally ended up with a flag of '48 of unidentified origin (inventory # 61.67.1), its most important characteristics can be read from the entry in the inventory book: 'On a cylindrical wood staff a faded white brocade flag, on one side the royal Hungarian, on the other side Ja'szbere'ny's Coat of Arms. 'Here we find as well that the staff is 312cm long, the flag 148x165cm in the shape of a vertical rectangle. According to the painted crowned Hungarian small Coat of Arms type it may have been prepared sometime during 1848-49, prior to the dethronization. Similar representations of the Coat of Arms appear on the home guard and defence troop flags as well. On the reverse of the flag the Coat of Arms of the city of Ja'szbere'ny is painted with total disregard as to the regulations, since the background is not blue, it is scarlet! On the flag's sides there are no red-green 'tongues of flame', rather, the relic is lined on three sides with fringes of the national colours. According to its measurements, it was possibly a infantry unit's.As to archival documentation for this flag I have none, so it is questionable as to whether we are dealing with a municipal flag, or some military formation's from the Ja'szsa'g or Ja'szbere'ny." looking at several examples of 1848-49 flags, they all have different devices (well - different artwork of the same element, of course). Concering the flags used in 1848 uprising and Kosut movement. In that time most flags (being mostly the military units flags) follwed that pattern with slight variations, often with triangular coloured border and crownless Coat of Arms . The crownless Coat of Arms is often refered as the Kosut arms. This flag is made after the detronisation with NO CROWN! The war flags of Hungary is the white with red and green wolf-teeth flags charged with the actual Coat of Arms and on the other side with St. Mary .I think this war flag could be used between 19.04.1849 - 27.09.1849, in the last months of the War of Independence. The date of the detronisation is 19.04.1849. Military flag from 1848 type A at <www.historicaltextarchive.com>. Yesterday I was in the Nemzeti Múzeum (HNM) and take some photos of the military flag from 1848 - reverse side. (Click 1,2 to see the photos). 3. The blue 'lake' is completely surrounded by a golden wreath, which is oval, nearly round. HONVÉD means soldier this is patriotic word. The word "katona" = soldier is neutral. The word "honvéd" = soldier means "the soldier who save our country". HON = homeland VÉD = save. The new Hungarian Army in 1848 was the Magyar Honvédség. The flag is a revolution flag.